Have you ever had an idea that excites you? An idea that brightens your eyes and lifts your spirits? You work on it, get it ready but when it comes time to share it and make it public you hesitate and ask, “should I”? Last week I had to ask myself this question when I was ready to launch a Virtual Craft Show. When it came time to hit publish and start sharing on social media, I froze. What if I don’t sell anything? What if what I’ve made isn’t good enough? I could go on and on, the little, or maybe not so little, inner critic inside my head was working overtime. I was afraid of the risk and the possibility of failure. But eventually I did hit publish and make it “Facebook Official” to start sharing and marketing the site. In his book, The War of Art, Steven Pressfield calls it Resistance, while Seth Godin calls it the Lizard Brain. No matter what you call it… the voices in your head do not want you to step out of your comfort zone. They do not want you to venture into the unknown and risk stumbling in front of the crowd. We all have it, we all experience it and succumb to it from time to time. This is the hard part. I love ideas, research, creating and exploring. That is the easy part. What I usually dread is the going public part. I’m both shy and introverted so putting my work, my art, my expertise out on display is hard. It can feel like taking yet another risk each and every time. Last week was no different. Over a weekend I decided to move forward on an idea of opening up a virtual craft show. It was fun and a challenge to put it all together in a short period of time. Then, when it was time to make the craft show public, the resistance, the lizard brain, the self-doubt kicked into high gear. I had a post ready to go on Facebook but it sat there awhile before I hit publish. Yikes! That was hard. But I resisted the resistance and published anyway. Why? Because growth, inspiration, creativity, learning valuable lessons, and more only happens when we push forward. Sitting still and being stagnant may be more comfortable but there is no reward, there is no joy or satisfaction that comes from overcoming an obstacle. I’ve learned over the years that if I’m not at least slightly nervous about trying something new, the idea is probably not worth pursuing or is not BIG enough. Being scared to step out of our comfort zone is normal and not something to squash instantly. It is a tool that can be used. We have to ask why we are scared? Is it just because it is new? Unknown? Is it a step forward in faith or is it a nudging in our spirit saying, now is not the time. Only you can answer that question for yourself. But if it really and truly is being scared because it is new, unknown and a leap of faith, then most likely we need to move forward and go for it. There is risk of course. It could fail, it could not work out. But maybe, just maybe it will work out brilliantly! What if you stop just short of success? You won’t know until you try. I don’t like to fail. It is hard on the ego, it is discouraging and frustrating. It can make you feel like nothing is going right and you are doing something completely wrong. And in the moment it is hard to see past those feelings. But, that should not stop us. We learn, we evaluate, we grow and try again. If we don’t, that is when we fail. What if it works? That is an amazing feeling. But again, you won’t know until you try it, even in the midst of being scared. So I pushed past the fear and the resistance and hit that publish button. Is it working? No, not really. And yes it is discouraging. I’m going to let myself have a pity party, acknowledge that I’m frustrated and then move on. Then, I will evaluate, grow from what I have learned and try again. 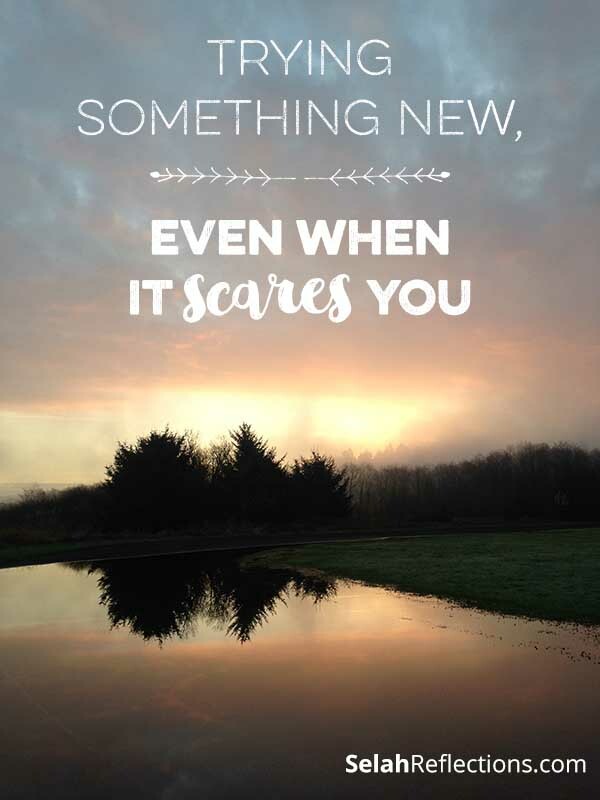 What can you try this week even though it scares you?